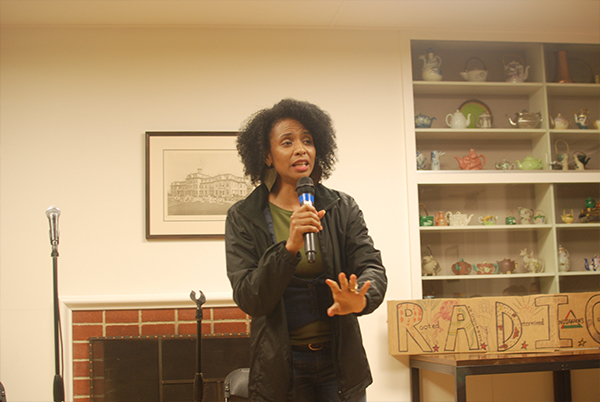 RADICAL, a new club on campus, hosted Take Back the Night on Wednesday, April 17th, in the Reinhardt Alumnae House. Rooted Ancestral Determined Indigenous Cooperative Attaining Liberation (RADICAL) successfully brought this nation-wide event to the Mills campus to provide a safe space for sexual assault survivors and allies as a place to provide resources and compassion. The event started at the front entrance, Richard’s Gate. Participants then proceeded to march through campus chanting “Survivors unite! Take back the night!” and “Hey hey! Ho ho! Sexual assault has got to go!” in unison. Fellow students passing by in their cars or sitting on benches near by caught wind of this fired up crowd and held up their fists in solidarity. Participants help up these two signs together in solidarity with the survivors of sexual assault. The march ended in the Reinhardt Alumnae House where dinner was served out on the lawn. After dinner, everyone gathered inside the house and watched performances: poetry readings, musical performances, and community outreach. 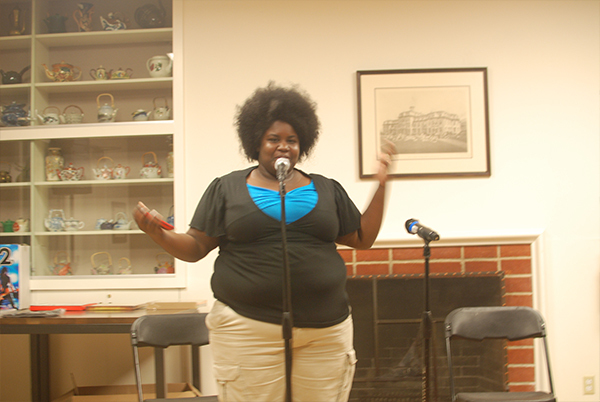 Performers included Desire Johnson, Diana Nguyen, Venus Jones, Larri Mariola, Favi, and Aisha Fukushima. 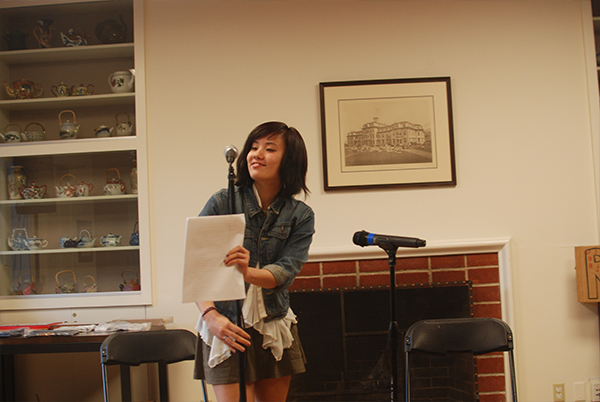 First-year Diana Nguyen reads a poem that she wrote. 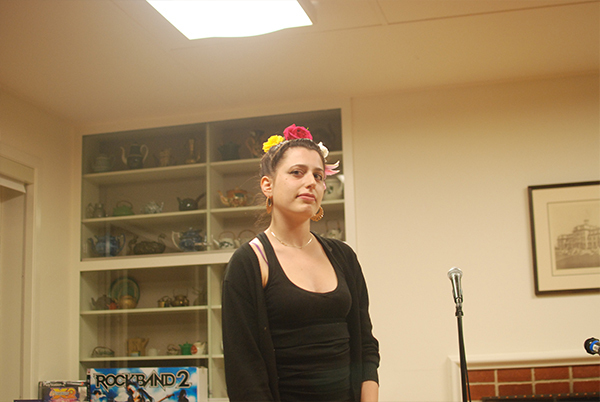 Venus Jones performs a few poems and later sings with First-Year Larri Mariola. 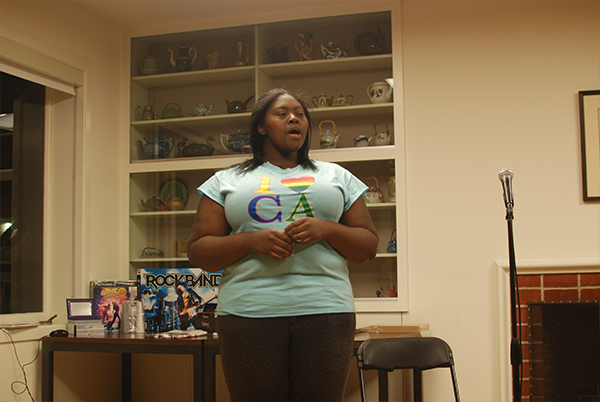 First-year Larri Mariola sings a song with Venus Jones. Senior Desire Johnson, one of the coordinators of the event, shares her personal story and reads a poem. 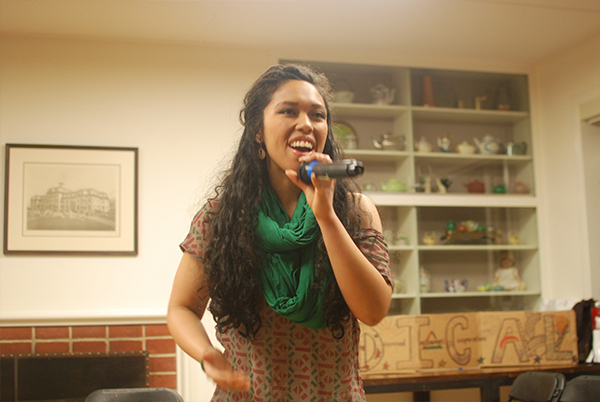 Bay Area artist, Favi, shares her personal story through a song and rap in both English and Spanish. Aisha Fukushima, a San Francisco native and internationalist, sings songs of her own as well as a cover of “Hometown Glory” by Adele. In between every five performances, there would be a ten minute break. This allowed for an open mic for those who felt ready to share their stories or support. There was also a raffle during the break. Prizes like band T-shirts and CDs were given out as prizes. This raffle will continue until the end of the month. The first raffle ticket was free, but if you wanted more, they went for $1 each. Part of the proceeds go to RADICAL, but the other part of it went to MISSSEY (Motivating Inspiring Supporting and Serving Sexually Exploited Youth), a community based organization in Alameda County that provides a safe space for sexually exploited youth. After an evening of compassion, poetry, and music, the crowd gathered on the lawn behind the Alumnae House for a candle lighting ceremony led by Laura Engelken, Director and of the Religious and Spiritual Life on campus. Participants were invited to light a candle and place it in a box and outwardly speak of what “fuels their fire” or silently do so. RADICAL will continue to hold events until the end of the month in honor of Sexual Assault Awareness Month. Allies and survivors are encouraged to wear teal to raise sexual assault awareness. Denim Day will take place on April 24 and everyone is encouraged to wear denim to raise awareness. A new support group for survivors of sexual assault is now being offered through Counseling and Psychological Services. For more information, contact Dr. Jennifer Panish at jpanish@mills.edu or Dr. Dorian Newton at newton@mills.edu. RADICAL will also be hosting Take Back the Day on April 30.